Reintroduce moderation into the nation conversation. Money and our economic future. How do we educate our future. What is the Moderate Party ? Trying to bring the sensible middle back to the forefront of U.S. Politics. We live in the start-up era. Why is our country run by two parties started in the 1800s? We currently live in a time of boundless communication and access to knowledge that would have seemed supernatural at one point in our country's history. With modern problems coupled with an onslaught outside influences, the two parties are ill equipped to drive this country forward. 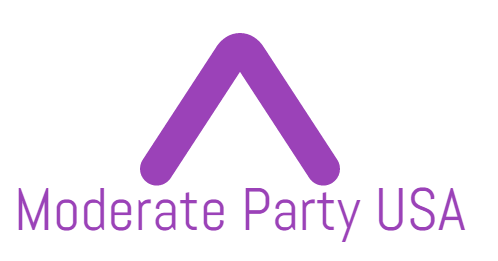 We present an alternative, a fresh vibrant party. Ready to meet the problems of the world today and drive the changes needed to our currently dysfunctional system. Empowered by the strengths of both parties, the Moderate Party USA is ready to drive the country forward. Review our stances, and take some time to seriously sit and think about our system. What is the role of money in politics? Should the most extreme loudest voices in both parties drive the direction? Can we get past sound bite politics and return to great people leading through intelligence and fortitude empowering our talented people to make this nation grand. We are a nation of exceptional talent. We simply need to fan the flames of that talent, get out of its way, then watch the many great things that will flourish because of our investment in the people. Our nation's status was hard fought it is our duty to remember the fight is not over, and it is simply our turn to do what so many have done before us and keep this nation grand. The road ahead begins with you. Come back later once we’re fully up.